LAS VEGAS -- Digital health care is growing at a rapid pace, as innovative technologies and solutions are revolutionizing the health management and treatment paradigm. Signaling widening interest in the convergence of technology and health care, mobile health devices, wearables and wellness gadgets are a major part of this year’s Consumer Electronics Show in Las Vegas. Alongside big names in conventional electronics, 521 digital health, 631 wearables and 151 fitness exhibitors have arrived at the annual CES show to tout their cutting-edge technologies and products to visitors and investors, according to the CES exhibitor directory. From mobile health devices and wearables to wellness gadgets and sleep analytic technologies, health-tech companies and startups showcased their creations to global visitors. Some products are already in the market, while some are preparing to go commercial. Medical gadgets employing artificial intelligence offered a glimpse at the ability of AI to overcome the limitations of physical disabilities. One such firm is Israel-based OrCam, a developer of artificial vision devices for those who are visually impaired. OrCam was established in 2010 by the two co-founders of Mobileye, a collision avoidance technology startup that was acquired by Intel for $15.3 billion in 2017. 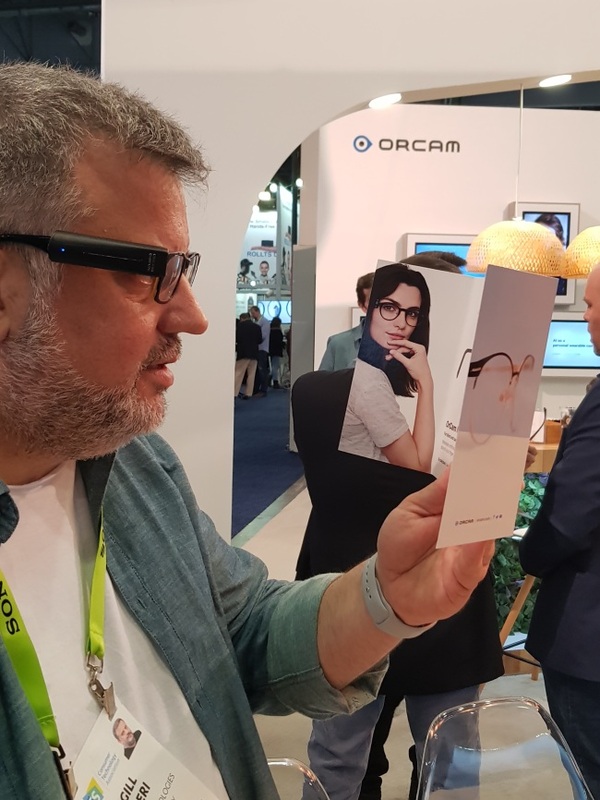 At CES, the company is showcasing the OrCam MyEye 2, its latest advanced wearable assistive technology device for the blind and visually impaired. The device -- which weighs 22.5 grams and is 5.08 centimeters long -- can read aloud text, recognize faces and identify products, providing critical support to the blind or visually impaired. It can be easily attached to the side of eyeglasses. Many wearables for health maintenance and vital signal tracking also took up a large portion of the exhibition space at the Sands Expo and Convention Center. Healbe, a Russia-based tech startup, has developed a fitness band that can track calorie intake automatically with 90 percent accuracy. This means no more having to input food intake onto dieting or wellness tracking apps manually, the startup said. The bracelet is fitted with sensors that measure in real time the behavior pattern of interstitial fluid that is released when our body digests food. By tracking this activity, the startup’s algorithms can backtrack the amount of calories a person has ingested. A number of South Korean startups are also attending CES in the wellness wearable space, including Samsung spinoff Welt, the developer of a “wellness belt” that tracks waist size and suggests relevant health routines. Seoul-based startup Olive Healthcare Platform is promoting the Bello, a portable scanner that uses near-infrared spectroscopy to measure abdominal fat, a key marker associated with a variety of diseases and a problem area for dieters worldwide. Meanwhile, BrainCo, a Chinese startup in the brain machine interface technology space, showed off a headband that uses electroencephalography -- EEG for short, a method of monitoring electrical activity of the brain -- to quantify people’s concentration levels. The head wearables have diverse applicative value, be it enhancing classroom learning with brain training exercises or helping athletes get the most out of their workouts by achieving the highest level of focus through brain-controlled games, the startup said. On top of medical technology and wellness devices, an entire section of companies dedicated to “sleep technology” drew large crowds. Products featured ranged from posture-tracking massage chairs and anti-snoring pillows to sleeping pods and self-adjusting mattresses. Korean startup 10Minds showed off its “smart motion pillow” that tracks head position as well as snoring sounds. When a person starts snoring, the pillow automatically adjusts its height and angle in a gradual manner to prevent snoring and improve sleep quality. 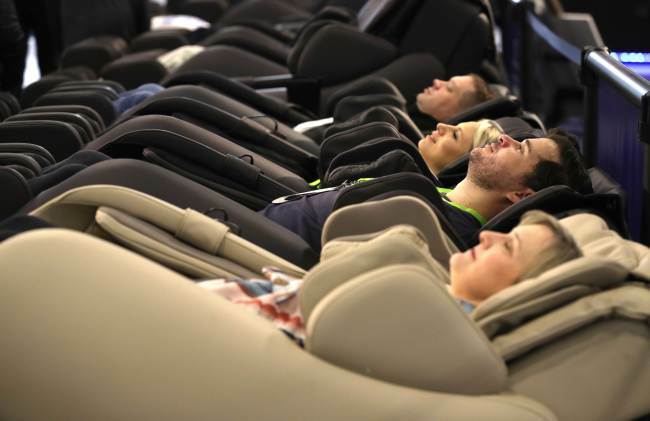 Other companies brought full-on sleeping systems to the tech show, including Silence Business Solutions, a French company that sells “sleeping rooms” or “recovery cocoons” to companies. For CES, it brought the Procyon Dream Box, a pod fitted with a bed and specialized lighting system, for a quick demo. 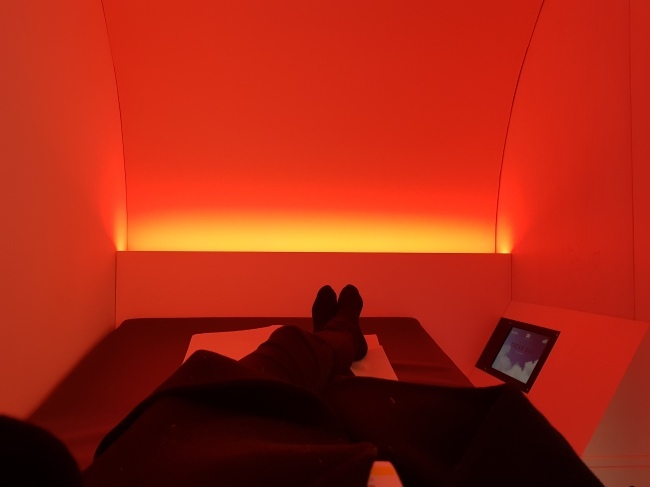 Stepping inside, the user is immersed in a chromotherapy atmosphere alongside soothing music for a quick 15- to 20-minute power nap. Chromotherapy, also referred to as color therapy, is the science of projecting colors to one’s body to stimulate healing in physical and mental health. Alongside smaller startups, health care giants, including Philips and Fitbit, showcased their latest product lineups at the digital health pavilion at the Sands Expo and Convention Center at CES 2019. A sizeable number of investors also made their way to the exhibitions, seeking to discover promising health-tech startups to acquire.